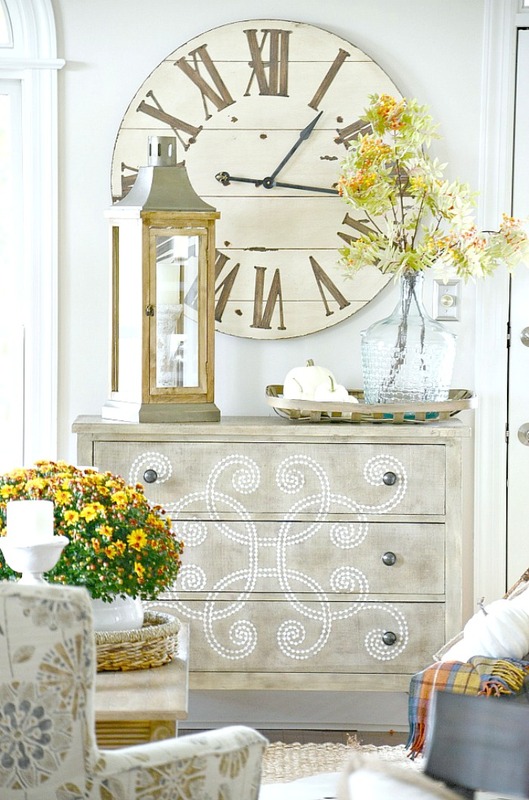 Does your home need a little bit of fall decor updating? I’m sharing the best decor essentials for fall today! Lots of pretty things and ways to use them too! Put away the knick-knacks (not that I think you have them) and make this year’s fall decor natural and cozy and really really inviting! So let’s get our fall on and work it! Today on Decorating Tips And Tricks we are talking about WORST DECOR TRENDS OF THE LAST 50 YEARS! 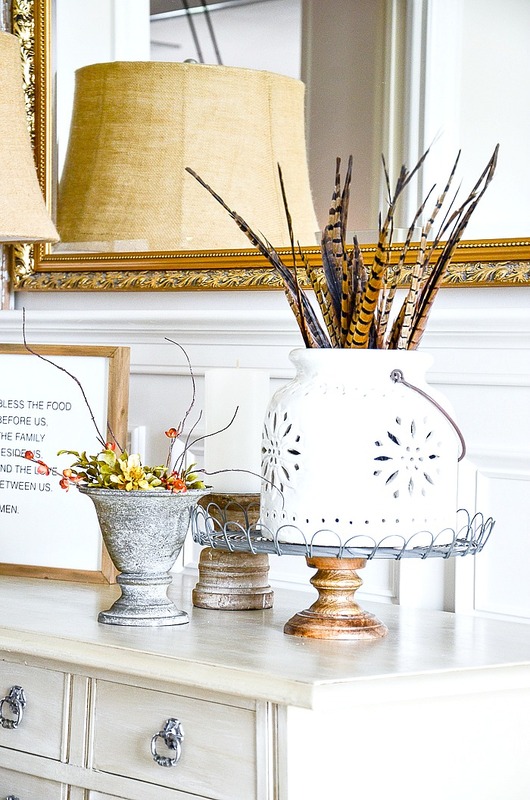 One of the best ways to keep your fall decor from looking tired and dowdy and outdated is to throw out worn out fall decor every year before you decorate and add a few new things. I do this for each season and it has left me with the best of the best to decorate with. No longer do we need the entire house and every corner filled with seasonal decor. Let’s be a bit more subtle and use lots of natural elements and just the prettiest things! Also, think about using everyday things in seasonal ways. Collect a pantry full of “staples” you can call into use at a moments notice to decorate. Oh, how easy and so satisfying! The lantern above is one of my favorites and I use it all year long. The smaller lantern is filled with pheasant feathers and placed on a wire-topped cake stand to give it a little height and visual importance. See both the big lantern and the small one together in the first image of this post. Instead of using a tablecloth why not use an Ancient Buchannan Tartan throw. This is our actual Scottish tartan on my husband’s side. Top this perfect-for-fall tartan with simple white dishes, or better yet log slice chargers and creamy white dinner plates! 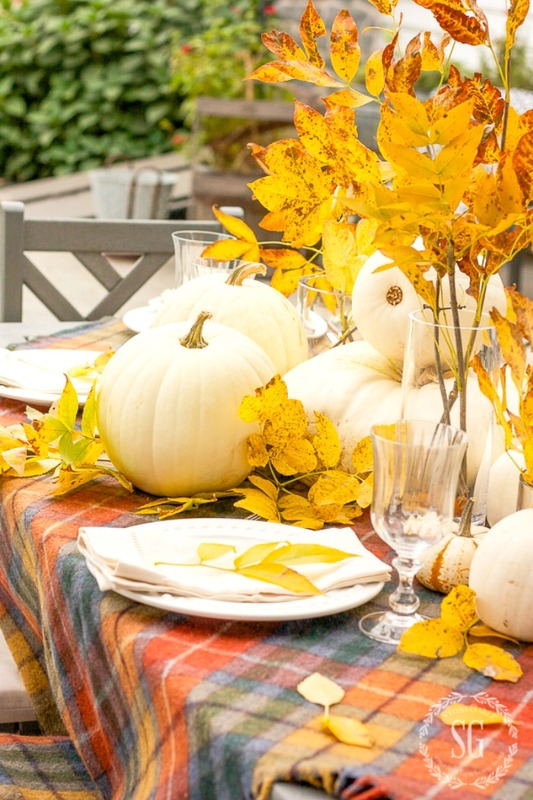 Add goblets, wooden flatware and glass cylinders filled with real or faux fall leaves. This table will work until Thanksgiving… indoors or out! 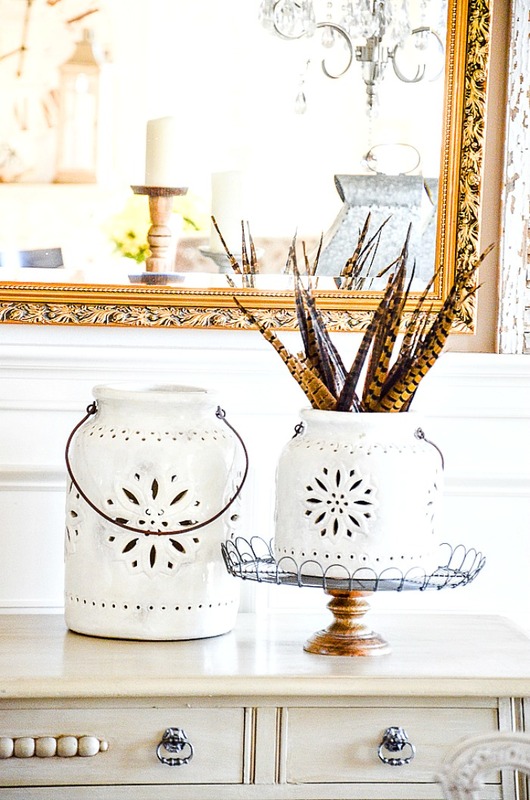 Create a stunning natural vignette with just a few items. Use a tray, I’m using a wooden one for extra texture, a cake stand topped with a cloche full of white pumpkins and gourds, a couple chunky candle holders and a creamer holding pheasant feather. Can you tell how much I love pheasant feathers for fall? Oh, don’t forget the small bittersweet candle rings. I cut them apart and wrapped them around the cloche! 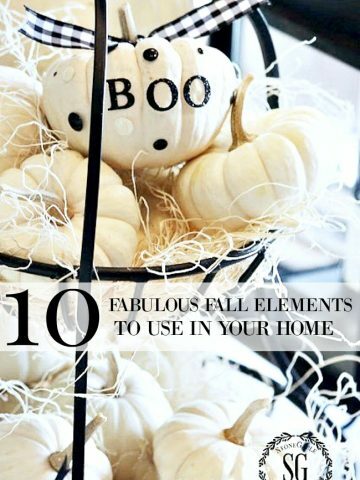 Such an easy peasy fall decoration! A large lantern standing tall with a chippy candle holder in it on one side of my Curlacue chest. And a tobacco basket filled with little white pumpkins and a large glass table vase and a few real or faux fall leaves on long stems on the other. This would look great on a kitchen island or a dining room table with two lanterns flanking the tobacco basket. 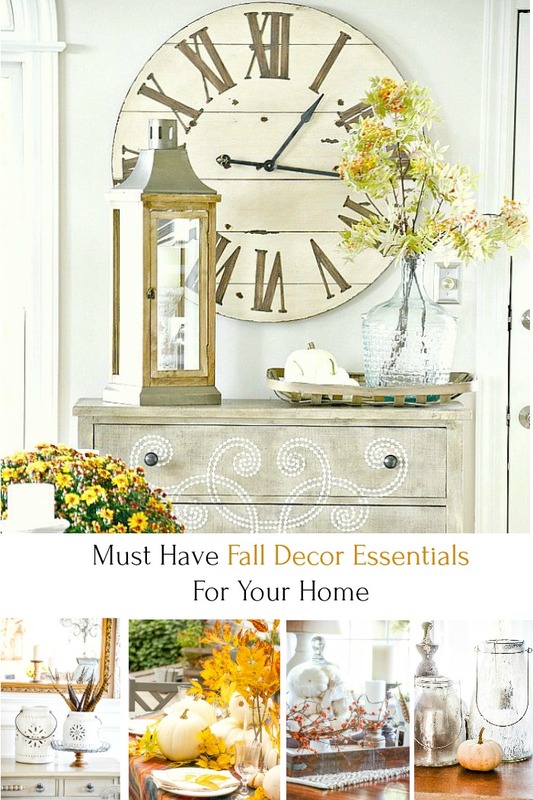 Now here are fabulous fall decor essentials I’ve picked out for this season! LOVE the glass and oak hurricanes just as they are! Pumpkin baker on top of wood slice pedestal. A pretty juxtaposition! Use what you have and add a few more things to your fall collection this year! 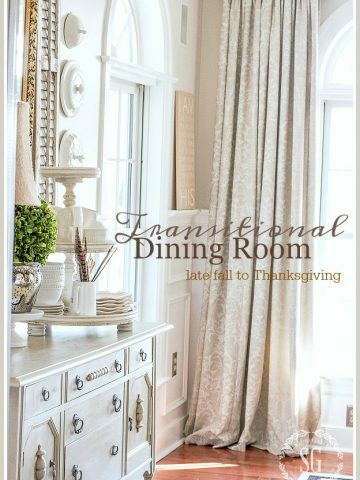 What will you be decorating with this fall? You truly know how to make a gal appreciate seasons. I always look forward to what you post next, because each post is creative, and downright gorgeous. Thank you for all you share with us readers/followers. Yo nailed it again! beautiful as always – I try to wait until the eve to look at my SG newsletter because it’s such a treat! and, I can imagine Fall is indeed around the corner when I look at all of your lovely décor… <3 I am absolutely falling for white pumpkins, and I am going to find a great lantern on sale somewhere!! Yvonne, I like the many ways you decorate with your cloche and think the little gourds and pumpkins are a great focal point for the vignette (I ordered them from the blog site and can’t wait to use them). I am happy you are posting fall ideas because it is so easy to jump into Christmas and miss the lovely colors and textures of fall. Your fall collections from years past are great too! Love your fall decor tips and thanks for the shipping list! Hugs! 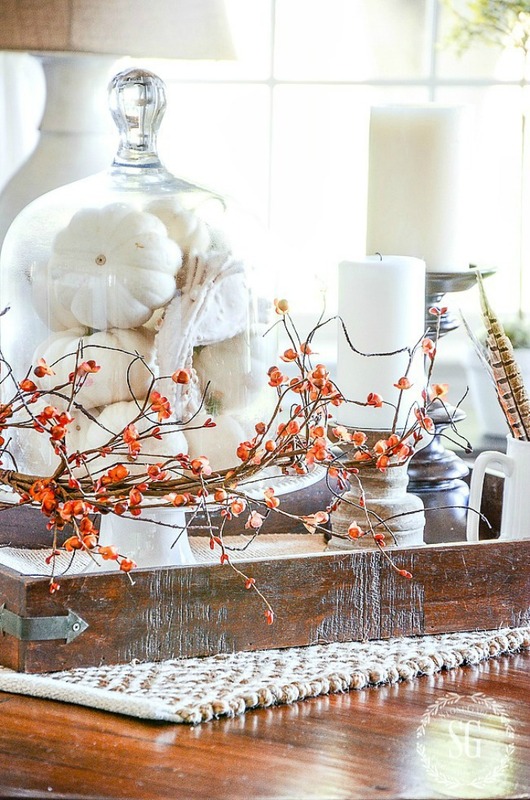 You gave some great examples of bringing in Fall décor. It has been hard to think about Fall décor when its 90 degrees outside and still feels like mid-summer this week in central VA. However, today I will bring out my Fall storage tubs and start going through them. I also try to weed out things I no longer use or feel are outdated at the end of each season. I do have a few “staples” that I always use just as your white lanterns. One being my vintage mid-century brass pheasants. I am a person who doesn’t like clutter but yet a clean, fresh look so I like subtle touches of the season. Happy Fall Decorating! Another awesome post Yvonne! I’m addicted to fall?? Thank you for sharing the sources also of where to purchase some of your elements. I’ve learned so much from you, Yvonne. These are lovely inspirations that anyone can imitate. Love the idea of using subtle and natural elements instead of decorating every crook and cranny of the house. Happy Fall! 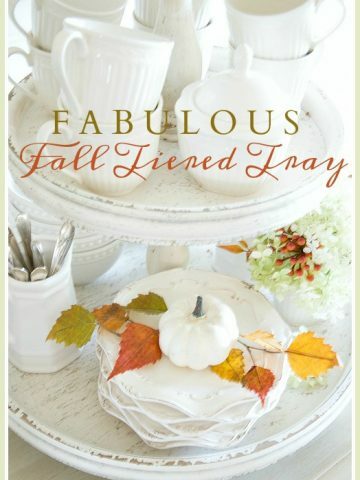 Beautiful inspiration for Fall! In Texas we had a very hot summer, and I am ready for cooler temperatures and Fall decor. I have loved your punched ceramic lanterns for years, and I was thrilled when I saw Pottery Barn was re-releasing them. I pre-ordered them a few months back, and they came in yesterday! I went back to your blog to check to see if they’re like yours and they are! So any of your readers who love those should get them. I love them! I know you will love them as much as I do! 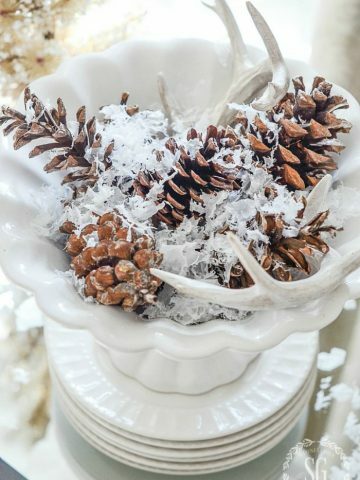 I love the simplicity of this decor – we do not need a seasonal decor that screams in our faces. I just changed out my Norma Fleming large bowl, inserted a pumpkin, and filled the bowl with fall pods, tiny pumpkins and grapevine orbs. My tall clear vases with white flameless candles, round rush material placemats and table runner finish off my farm house table to a tee! Other than a fall mantel refresh and transitioning my front porch from summer to fall I’m ready for fall. Thanks for this post. Love the plates with the pale blue gourds. Is there a source for them? Click on the image and it will take you to where you an buy them.